Lindsay Ahl’s chapbook, The Abyssians, was a finalist for the 2013 National Poetry Chapbook Award. Her poetry has appeared in Barrow Street, RHINO, Vellum, Drunken Boat, New Delta Review, and many others. Her fiction includes a novel, Desire, out with Coffee House Press, and stories in The Brooklyn Rail, BOMB Magazine, Fiction magazine, and others. She publishes Shadowgraph, an arts & culture journal. “You see that meadow over there?” An innocent enough question quickly takes on a life of its own. The hiker’s memory of the dog, long buried, brings a shade of her into the physical world. The dog is an echo of the question, “You see the meadow?” created as the memory of the dog and this place intertwine in both hikers’ minds. This is how memory propagates. One person’s direct experience becomes an echo in the mind of a person hearing of that experience. Both the echoing story and the original experience are real memories. These two typefaces represent different forms of decay: Phosphorus Oxide disappears from the inside out and Roman Antique dissolves inward from the outside. Neither maintains complete spatial integrity against the white of the paper, perfect for a poem about the thin places between memory and the present moment. 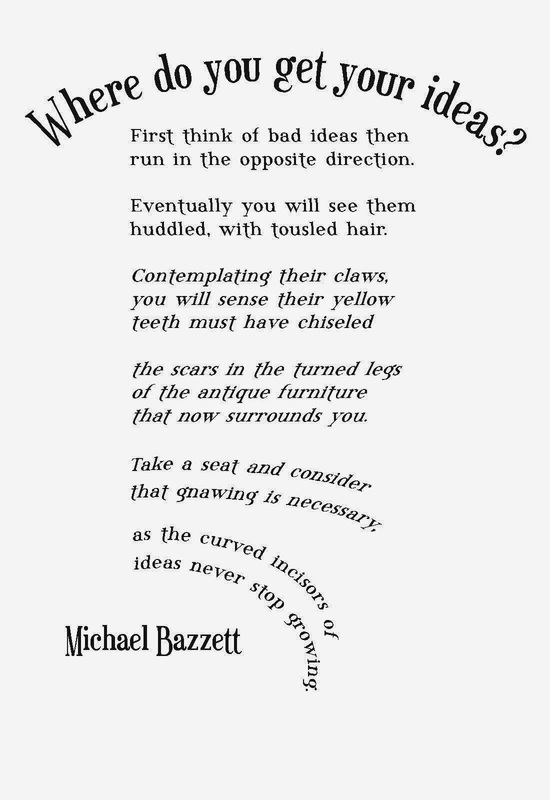 Michael Bazzett’s poems have appeared in Ploughshares, Massachusetts Review, Pleiades, Oxford Poetry, Virginia Quarterly Review, and Poetry Northwest. He was the winner of the Lindquist & Vennum Prize for his first full-length collection, You Must Remember This, (Milkweed Editions, 2014). The writing process can be mysterious—sometimes even to writers—so is it any surprise to find a tall tale filling in for a satisfying answer? It’s certainly more entertaining than the truth that lurks beneath the fanciful elements of this poem: creativity isn’t passive at all. There’s no muse to hand you something beautiful and fully realized. You’ve got to get out there, dodge the bad ideas and run the good ones down. And when you find them—the truly creative ideas—you won’t be sure what to make of them at first. Only then can you be still, or try to be still in the presence of something wild, something with the means to hurt you, something that will very likely mark you with its teeth. Without a satisfying explanation of their origins, ideas become fantastical creatures, surfacing from our subconscious like the Loch Ness Monster. 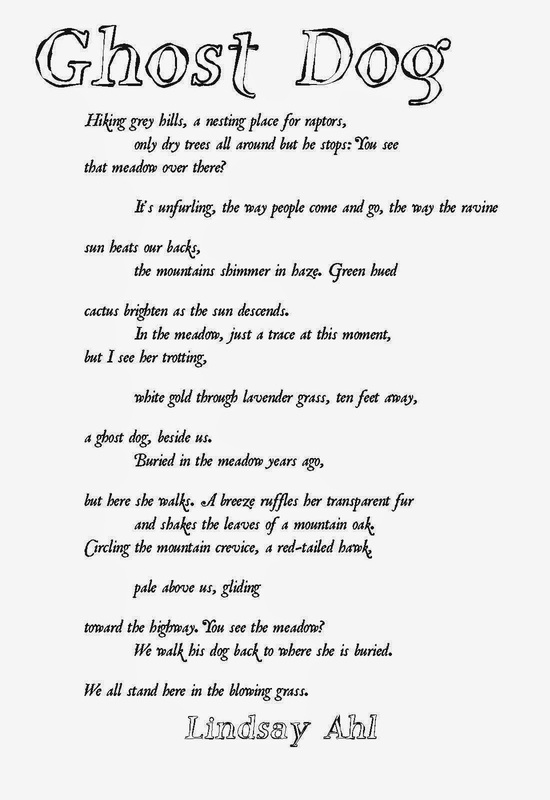 The typeface for this poem had to capture that unbounded outlandishness while remaining legible through increasingly intense curvature. Phosphorus Bromide does just that, and Euphorigenic provides a complimentary whimsy. After all, the teeth aren’t real, but the idea of teeth.